OAKLAND, Calif. – This city’s International Boulevard was a sea of white shirts and American flags April 10 as thousands marched more than nine miles from the city’s eastern border to City Hall downtown. 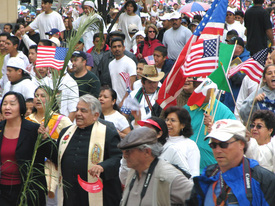 Walking beside the lead banner — “Family, Unity, Dignity, Values” – was Father Antonio Valdivia, pastor at St. Louis Bertrand Roman Catholic Church, the march’s starting point. Father Valdivia and other religious leaders initiated the demonstration just weeks before. The demonstration was a family affair. Babies peered bright-eyed from strollers, while toddlers rode high on daddies’ shoulders. The largely Latino crowd of 10,000 included many students, and marchers said many workers took the day off to participate. Zamora said he had passed out fliers about the demonstration at school.